A replacement for the 5000 and 3000. Specifications, details, articles, and reviews about the Epson 4000 A2 8 color printer. More pix and detailed info below. One of our oldest article pages – retained for information. Comparing the 7600 and 4000 – which should you buy? This page has information about printers, collected before they were announced and actual product details.We have left all of the original info on the page for completeness. 2005 May 2nd – More details and specs (downloadable reference manual link) on the 4800 and 4400 are on the 4800 page. 2004 September — UK Free paper promo, but still some reports of difficulties in getting this printer. 2004 4th March — A “delay alert” is posted by Epson for the 4000 — Full details at end of page (this news picked up from the US, so check its veracity with your local suppliers or the ads on the left). We’ve included most of the comments we’ve been sent here, so you may have to pick through several to get a reasonable picture… Thanks to everyone who has sent us info! Advanced 17″ Wide Desktop Printer for Professionals. 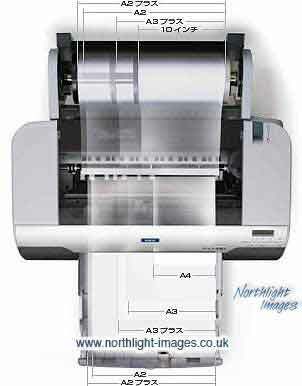 Epson is the standard by which all other photographic ink jet printers are measured. So when we decided to build a next-generation desktop printer, it had to be a breakthrough. The result is the all-new Epson Stylus Pro 4000 desktop printer. Designed to meet the needs of the most demanding professionals, the Epson Stylus Pro 4000 incorporates a unique 17″ wide printer design with all of our latest ink, print head, and printer engine technologies, ensuring your creative vision will be produced without compromise. Utilizing Epson UltraChrome™ Ink technology, you’ll produce archival prints with amazing color fidelity, while providing consistently stable colors that significantly outperform standard dye ink technologies. In order to maximize the use of this remarkable ink technology, we’ve developed a unique 8-channel print head capable of handling eight separate ink cartridges simultaneously. This allows the Epson Stylus Pro 4000 to handle both Photo Black and Matte Black inks at the same time in order to maximize the black density on virtually any media type. Even more remarkable, the new high-performance 1″ wide print head produces an astonishing resolution of 2880 x1440 dpi to deliver a level of image quality and speed that even exceeds our previous best. Handling virtually any media type in roll or cut-sheet up to 17″ wide, the Epson Stylus Pro 4000 even incorporates a high-capacity paper tray capable of handling cut-sheet media up to 17″x 22″. Choose from four different ways to load media, including a front-loading straight-through path for media up to 1.5mm posterboard, giving you the ultimate in media flexibility. The Epson Stylus Pro 4000 represents the highest level of Epson printer technology to date. From photographic quality and high-performance print speeds to breakthrough ink technology and media handling, the Epson Stylus Pro 4000 combines innovative technology with extraordinary performance and value, allowing you to work faster while giving you the ultimate creative edge. The Photographic Ink Mode is ideal for any photographic or graphic design project where image quality is important. It uses Cyan, Light Cyan, Magenta, Light Magenta, Yellow, Photo Black, Light Black and Matte Black. The Dual CMYK Ink Mode takes advantage of our Matte Black ink technology to produce outstanding photographic prints on plain paper. It uses two of each primary color to deliver speeds up to 98% faster than the Photographic Ink Mode and is the perfect solution for engineering/scientific applications like CAD or GIS mapping. The Epson Stylus Pro 4000 utilizes our latest print head technology – making it one of the fastest ink jet printers ever made by Epson. Epson America Inc. today announced the EPSON Stylus Photo R800, a new desktop photo printer featuring new Epson UltraChrome™ Hi-Gloss™ pigment inks for archival prints on matte and glossy media. With an estimated street price of $399, the EPSON Stylus Photo R800 lowers the entry price for photographers and digital artists that want archival prints but do not need a large format printer. The EPSON Stylus Photo R800 is capable of making photo quality prints up to 8.5 inches by 11 inches on cut-sheet paper and up to 8.3 inches by 44 inches on roll paper. The Epson UltraChrome Hi-Gloss ink set is designed specifically for photographers and digital artists. This ink set includes eight individual cartridges and features the new Gloss Optimizer as well as Photo Black and Matte Black ink cartridges. With an eight channel print head, the EPSON Stylus Photo R800 allows the user to keep the Photo Black and Matte Black ink cartridges in the printer at all times and the printer driver determines which black ink to use based on the paper type selected. In addition to the traditional cyan, magenta and yellow inks, the Epson UltraChrome Hi-Gloss ink set also includes new red and blue inks to create a Hi-Fi ink set that expands the color gamut. The color gamut for the Epson UltraChrome Hi-Gloss ink on glossy paper is up to 22% larger than ink jet printers with standard cyan, magenta, yellow and black ink sets. The EPSON Stylus Photo R800 utilizes Epson’s Advanced Micro Piezo ink jet technology to achieve a 1.5-picoliter ink droplet and resolutions up to 5760 x 1440 optimized dpi. The 1.5-picoliter ink droplet sets a new standard as the smallest droplet size in the ink jet printer industry. The EPSON Stylus Photo R800 is the fastest printer in the Epson photo printer line featuring text speeds up to 17ppm and photo speeds as fast as 45 seconds for a beautiful 5″ x 7″ photo in photo mode on EPSON Premium Glossy Photo Paper. This printer model also features direct CD printing capabilities enabling customers to print directly onto printable CDs or DVDs by placing them in a tray that slides through the printer’s front-loading, straight-through paper path. This CD printing capability is an Epson exclusive feature, first introduced with the EPSON Stylus Photo 960 and is also available with the EPSON Stylus Photo 900 and EPSON Stylus Photo R300/300M. Macintosh and PC users can create their own CD or DVD designs, or utilize colorful backgrounds and images from the EPSON Print CD software, which now supports Mac OS 10.2 or higher and comes bundled with the printer. Only ink-jet printable CD-R and DVD-R media are compatible with the EPSON Stylus Photo R800. Ink-jet printable CD-R media are produced by several major media brands including Imation, Maxell, Memorex, Mitsui, TDK and Verbatim. The ink-jet printable CD-R media can be purchased from a variety of online retailers including www.cdw.com, www.macconnection.com, www.pcconnection.com, www.warehouse.com, and www.zones.com. By utilizing innovations such as PRINT Image Matching technology and Epson’s patented, true BorderFree™ photo printing technology, the EPSON Stylus Photo R800 is able to produce the best prints possible in a variety of frame-ready and portfolio-ready photo paper sizes. Customers can effortlessly print their photos on Epson’s Borderless 4″ x 6,” 5″ x 7,” and 8″ x 10″ photo papers without having to trim the borders or tear off perforations. Epson offers a wide variety of papers for use with the EPSON Stylus Photo R800 including EPSON Premium Glossy Photo Paper, EPSON Premium Semigloss Photo Paper, EPSON Premium Luster Photo Paper, EPSON Enhanced Matte Paper, EPSON Matte Paper-Heavyweight, EPSON Premium Bright White Paper and plain paper. The EPSON Stylus Photo R800 produces long-lasting photos which can resist fading up to 80 years(a) with Epson’s optimized combination of EPSON UltraChrome Hi-Gloss Inks and Epson’s matte or glossy media. The EPSON Stylus Photo R800 will be available in February 2004 for an estimated street price of $399 through mail order, computer superstores, specialty camera stores, and Epson’s retail Web site (www.epsonstore.com). The printer is backed by the one-year EPSON Exchange Warranty and is supported by the EPSON Connection, a customer support technical assistance line. Epson offers an extensive array of award-winning image capture and image output products for the consumer, business, photography and graphic arts markets. The company is also a leading supplier of value-added point-of-sale (POS) solutions for the retail market. Founded in 1975, Epson America, Inc. is the U.S. affiliate of Japan-based Seiko Epson Corporation, a global manufacturer and supplier of high-quality technology products that meet customer demands for increased functionality, compactness, systems integration and energy efficiency. Epson America, Inc. is headquartered in Long Beach, Calif. Note: Epson and EPSON Stylus are registered trademarks of Seiko Epson Corporation. Third party brand or product names are trademarks or registered trademarks of their respective holder. (a) Lightfastness ratings based on accelerated testing of prints displayed indoors, under glass. Actual print stability will vary according to image, display conditions, light intensity, humidity, and atmospheric conditions. Epson does not guarantee longevity of prints. For maximum print life, display all prints under glass or laminations or properly store them. could this ink set find its way into the 4000? 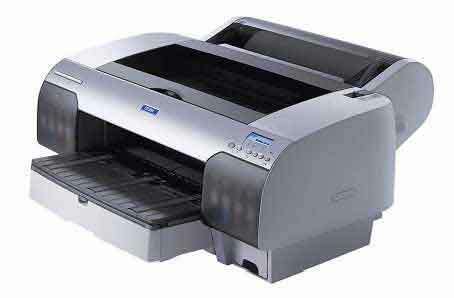 Epson 7600 or 4000 – which is best for you? $1200 less than the Epson 7600. 17″ wide format, although only 4″ wider than the Epson 2200, 17 inches does allow one to now print the popular 16″ x 20″ format and have at least a 1/2″ border all the way around. The standard 17×22 has 51% more image area than the standard 13×19 format. The 4000 is between 1.7 and 1.9 times faster than the 7600 (because it has 180 nozzles per color vs. the 7600’s 96 nozzles per color). It has a slightly smaller foot print than the 7600. Auto switching between Matte Black and Photo Black ink modes is a feature than many will appreciate. To switch black ink modes on the 7600 wastes time and about $100 worth of ink. If you’re not a photographer or other artist who needs 7 ink colors, the option of having an Engineering Bundle with the Dual CMYK print engine configuration is pretty cool and speedy (up to 1.9 times faster than the photographic model, which is already 1.7 to 1.9 times faster than the 7600). 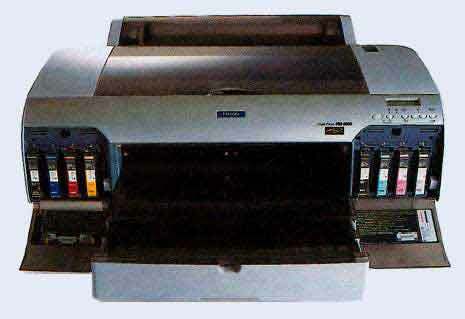 The Epson 4000 has a paper tray. The 7600 does not have a paper tray or a stack loader. It can only print sheets by loading one at a time. Both printers can print from rolls. 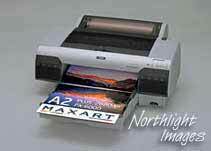 The 4000 can also print one sheet at a time, allowing for the use of heavy and thick art papers, just like the 7600. Both allow up to 1.5mm thick (60 mil) media. Most artists won’t need RIP software for use with their Photoshop images, but if you do (for vector and PostScript files), the Epson Stylus Professional 2.0 Software RIP is only $299 for the 4000. You’ll pay $1995 for the EFI Fiery Spark Professional 2 Software RIP for the 7600. The least expensive 3rd party RIP for the 7600 is $995. The 4000 comes with FireWire connectability built in. On the 7600 you’ll need to pay $199 for an accessory FireWire card. Additional 1-Year EPSON Preferred Plus Service (in addition to the 1-year that comes with the printer purchase) is only $279. An additional year for the 7600 is $725. We think the service costs might be lower for the 4000 because of another advantage it has over the 7600: The 4000 has “Auto Head Alignment & Nozzle Check Technology”. A built-in white beam sensor precisely aligns and checks all color channels automatically. This means fewer service calls from inexperienced users. Epson is claiming that the 4000 has even more accurate “Professional Level ICC Profiles” that give “extremely accurate color out of the box”. It is limited to 17″ wide. 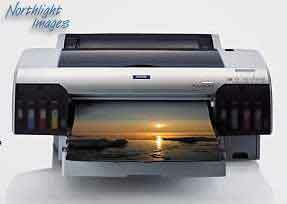 Many do not consider a printer to be “wide-format” unless it is at least 24″ wide. The standard 24×30 format has almost twice the image area (92% more) of the 17×22 format. No “dye” ink option (which is not much of a problem in our opinion, as we think dye is a dying option). An internal 10/100 Base T Ethernet card for the 4000 is $299. It is $239 for the 7600. *Based upon print engine speed only. Total throughput times depend upon front-end RIP, file size, printer resolution, ink coverage, networking, etc. ** Ink lightfastness rating based on accelerated testing of prints on specialty media, displayed indoors, under glass. Actual print stability will vary according to media, printed image, display conditions, light intensity, humidity, and atmospheric conditions. Epson does not guarantee longevity of prints. For maximum print life, display all prints under glass or lamination or properly store them. Visit http://ww.wilhelm-research.com for the latest information. LONG BEACH, Calif. – Oct. 20, 2003 – Epson’s newest and most advanced professional-level photographic printer to date is taking the form of a desktop design. The new Epson Stylus Pro 4000 creates exhibit-quality images up to 17 inches in width at speeds that nearly double that of previous Epson Stylus Pro printers. The printer features a new eight-channel printhead and seven-color Epson UltraChrome pigmented ink system that automatically switches between Matte Black and Photo Black inks for optimum print quality on different media surfaces. It’s also packed with several other advanced features designed specifically around the needs of today’s professional photographers, graphic designers, commercial printers, GIS mapping, CAD users and more. The Epson Stylus Pro 4000 takes advantage of the company’s award-winning Epson UltraChrome ink technology, a vital component to producing exhibit-quality prints that are sellable. This pigment-based formula uses seven individual colors (cyan, magenta, yellow, light cyan, light magenta, light black and switches between one of two other unique black inks) to create an extremely wide gamut of colors that eliminates color casts and enhances midtones. The printer can also be used to print a wide range of black and white photography using its lower density Light Black ink. Epson UltraChrome Inks are water resistant and offer lightfastness ratings for color images up to 100 years, and greater than 100 years for black and white prints, on specific Epson papers under non-UV glass. * When displayed under UV-protected glass, color lightfastness is rated at more than 100 years for all Epson’s leading professional papers. The quick drying nature of Epson UltraChrome inks also makes it possible to handle prints the moment they come off the printer. The Epson Stylus Pro 4000’s eight individual channels/slots can handle either 110 ml or 220 ml cartridges, or a combination of both sizes. Each cartridge also uses Epson’s Intelligent High-Capacity Ink technology, a feature that stores a variety of information on a memory chip (including ink levels), and communicates the data to the printer whenever the power is turned on. In order to produce the highest level of image quality possible on a wide variety of media types, the Stylus Pro 4000 (in its photographic mode) offers two black inks/modes (Photo Black and Matte Black) that are automatically activated by the printer. The printer operates in Photo Black mode whenever the user sets the printer driver for photographic media surfaces such as glossy, luster, or semi-matte. All seven colors are used in Photo Black mode, which includes a combination of Photo Black ink and Light Black ink to produce a D-max rating as high as 2.1. If the user selects a matte, cotton-based or fine art surface in the printer driver, the printer switches to Matte Black mode. This mode also uses all seven colors but uses a combination of Matte Black and Light Black inks to produce a D-max rating as high as 1.69. Images can be printed on virtually any media type (up to 1.5 millimeters thick) as wide as 17 inches using either rolls or cut sheets. Some of these media include plain paper and specialized Epson papers such as glossy, semi-gloss, luster, matte photographic papers, canvas and fine art papers, commercial-grade proofing media and more. Epson is also offering a complete set of professional-level RGB ICC profiles out of the box for extremely accurate color reproduction on a variety of these surfaces. A built-in high capacity media tray handles up to 250 sheets of plain letter sized paper or up to 50 cut sheets of photographic media up to 17? x 22?. Cut sheet media can be fed automatically using the printer’s high-speed cut sheet loading feature. Roll media users can take advantage of BorderFree™ printing, a feature that enables users to print over both left and right edges of the media while automatically cutting top and bottom edges for full-bleed prints on all four sides of the paper. A built-in cutter is included to trim prints faster and with greater accuracy and safety than manual techniques. User-adjustable roll media spindles can accept either two- or three-inch media cores. The Epson Stylus Pro 4000 offers a sleek, black and silver metallic design that features an easy-to-use front control panel with backlit displays and ink level indicators. Operation is simplified with six simple buttons located next to the display panel. Setup time and effort is also greatly reduced by a built-in auto head alignment feature. This technology uses a built-in white beam sensor that automatically scans printed alignment patterns created by the printer and then makes automated adjustments if necessary. The same white beam sensor is also used to detect clogged nozzles and automatically activate head cleaning cycles when/if necessary. The Epson Stylus Pro 4000 is capable of printing at 2,880 x 1,440 dpi resolution – resulting in finer blends and smoother photographic transitions. It also uses variable droplets as small as 3.5 picoliters to greatly decrease print time while optimizing photographic quality. Furthermore, Epson’s advanced Micro Piezo DX3™ ASIC technology controls the printing process to produce consistent image quality and color output from print to print. The Epson Stylus Pro 4000 prints up to 1.9 times faster than any previous Stylus Pro printer with the help of a new one-inch-wide print head packed with 180 nozzles per channel. Depending on the print mode, users can create an 8? x 10? photo-quality image as fast as one minute, seven seconds – or create an 8? x 10? at a quality level that surpasses traditional photo labs in approximately seven minutes, eight seconds. In addition to creating professional level photographs, the Epson Stylus Pro 4000 is also an ideal solution for pre-press proofing, graphic design, GIS applications, CAD engineers and other advanced digital imaging professionals. A ?Dual CMYK? ink mode is available for different applications and media types that enable users to dedicate all eight channels for running two identical sets of cyan, magenta, yellow and black inks simultaneously. The Dual CMYK mode provides an ideal combination of high image quality and even faster print speeds (approximately 1.9 times faster than the printer’s photographic mode) for applications such as GIS, CAD or plain paper printing. The Stylus Pro 4000’s ability to create 17? x 22? images is also ideal for graphic designers who typically create two-page mockups for magazines, brochures and other pre-press applications. Since many graphic designers are typically limited to 13? x 19? images on their current printing devices, the Stylus Pro 4000’s larger format creates prints with extra room around the borders for handwriting comments or signing off approvals. The printer can also handle C-size images that are commonly used by GIS and CAD users. An optional Epson Stylus Professional 2.0 software RIP featuring true Adobe PostScript 3 is available for graphic designers. Several other third-party RIPs and workflows will also be compatible with the Epson Stylus Pro 4000 to meet the printing industry’s most demanding work environments. The Epson Stylus Pro 4000 uses an Epson professional level photographic driver for Macintosh and Windows, allowing for complete density control even when the driver color management feature is turned off. A wide selection of printer interfaces includes one USB (1.1 and 2.0), one IEEE 1394 FireWire™ and one Epson expansion slot for installing the optional 10/100 BaseT Ethernet card. The Epson Stylus Pro 4000 is priced at $1,795 (estimated street price) and will begin shipping in January 2004 through authorized Epson dealers. An optional printer stand/cabinet will also be available for approximately $399. The Epson Stylus Pro 4000 is supported by the standard Epson PreferredSM Limited Warranty. This one-year program includes toll-free advanced telephone access Monday through Friday and typically next-business-day product replacement in the unlikely event of any hardware failure. Epson Preferred Plus Service Plans are also available, offering one or two additional years of protection that can be purchased at any time before the standard one-year warranty expires. For more information on Epson warranties, service programs and products, call 1-800-GO-EPSON (1-800-463-7766) or visit our Web site at www.epson.com. Epson offers an extensive array of award-winning image capture and image output products for the consumer, business, photography and graphic arts markets. The company is also a leading supplier of value-added point-of-sale (POS) printers and transaction terminals for the retail market. Founded in 1975, Epson America Inc. is the U.S. affiliate of Japan-based Seiko Epson Corporation, a global manufacturer and supplier of high-quality technology products that meet customer demands for increased functionality, compactness, systems integration and energy efficiency. Epson America Inc. is headquartered in Long Beach, Calif. Note: Specifications and terms are subject to change. EPSON, EPSON Stylus and Micro Piezo are registered trademarks of Seiko Epson Corporation. UltraChrome, BorderFree and DX3 are trademarks, and EPSON Preferred is a service mark, of Epson America Inc. All other product brand names are trademarks and/or registered trademarks of their respective companies. Epson disclaims any and all rights in these trademarks. 2003 17 Oct Epson has made an announcement of the new Stylus Pro 4000 printer official. Apparently it will be at the PhotoPlus Expo on Oct 30th thru Nov 1, 2003 (New York). They will give away one printer every day. It claims the price to be $1,795.00. Features include prints up to 17 inches wide; 7-color Epson Ultrachrome Inks with 8-channel print head technology that includes both Matte and photo black inks for automatic switching between black modes. Some additional (possible) info received..
*cartridge size up to 220 ml *Dilute Cyan and Magenta (or Cyan and Magenta-I forget which) replaced by red and lead blue, supposedly to enhance color gamut over previous pigment inks. New drivers that significantly enhance black and white printing ability, without purchase of additional RIP. Toned black and white prints are also said to be directly supported. It also confirms the $1800 US price. ?As expected an 8 ink printer size up to A2. What some will see as a replacement for the 3000 but in the article it is called a replacement for the 5000. Could be both of course. Software change between matte black and gloss black. Borderless printing up to 43 cm / 17″, roll and sheet. Maximum speed with 8 color mode 1 minute for A2, in CMYKCMYK mode 0,6 minutes. Up to 1.5 mm thickness of substrates. Monochrome prints variable in neutral, warm, cold, sepia. Maximum cartridge size 220 ml. Ink use is software controlled like in the 7600 etc. Waste container like the 7600. 3 versions of the printer: Stylus PRO 4000-C8 is the 8 color version for photographers, artists, design studios. Stylus PRO 4000-4C is the 2x CMYK version for 3D-CAD, industrial design, GIS and POP display. The Stylus PRO 4000-PS is the PostScript version for proofprinting. 3,5 picolitre minimum droplet size. Some talk about meniscus-control that I interpret as surface tension control to keep bleeding low and the dotshape correct. Maximum resolution of 2880 dpi. Ultrachrome ink. 70 to 75 years fade resistance a la Wilhelm. The article was in the 17 September issue of Grafisch Weekblad (Graphic Weekly). The copy of the article we were sent, is a PDF image. If you would like a version that was run through an OCR package, a (zipped) Word document is here BUT please note that since no-one here speaks Dutch, we’ve not checked the accuracy of the OCR process, other than to see it captured the text. The market segment it has right now is only 19%; they want to increase that to 35% in 2004. It replaced the PRO 5000 series. It has an 8-color ink system with automatic switching between black-matte and black ink. Borderless color and b/w prints are possible. Maximum print speed for an 8-color mode color print at A2 size is 1.0 minute and for a 2 x 4 color mode 0.6 minute. Monochrome prints are easily variable in neutral, warm and sepia tones. Old-fashioned style duotone and sepia tone are now possible and are given a new life here. It is easy to change the ink cartridges that have a content of 220 millilitre. Also, a system prevents the cartridge to be inserted in the wrong slot. Stylus PRO 4000C4 is a 2 x 4 (CMYK) color printer for 3D-CAD, industrial design, GIS and POP. A meniscus technology prevents dot gain and bleeding between dots and colors, assuring true dot size prints. The machine is less sensitive to changes in temperature and humidity. Maximum resolution is 1440 x 2880. The ink drop size is supposedly variable up to the largest 3 picoliters. Inks” Ultrachrome assures high stability and longevity. When the prints are covered with glass: more than 70 years for high-grade glossy photo paper and more than 75 years for textured art paper. The Museum for East Asian Art in Berlin made an agreement with Epson recently for co-operation. The first 50 art works are being displayed as Epson prints, because the original are extremely light sensitive and the Museum wanted to make copies that look just like then original, so that people can appreciate the art works. Now these art works can be scientifically and artistically examined by anyone, as the originals would be too delicate for such research. The new printing system assured a much higher gamut of colors; higher than that achieved by offset printers. Also, the prints have a much higher than normal D-Max (range) even in matte prints. No mention is made on maximum length of print; one would hope it can do panoramics up to 44 inches. Due to the unprecedented demand for the Stylus Pro 4000, the demand for the product continues to outpace the production capacity despite the enhancements to our manufacturing line. Epson will continue to work on increasing the production capacity. Due to this backorder situation, this product will be on severe allocation for the next several months. Allocation priorities will be set solely by Epson with specific priority based upon strategic criteria and business critical priorities. The initial allocation process will follow the same format as the Stylus Pro 7600 product with particular focus on resellers who provide a total Epson solution including the printer, ink and media. “The EPSON 4000 Pro bundle includes both an OSX and PC unique new version “LE” of the ColorBurst RIP. When bundled in the “Pro” this LE version is supported only by EPSON. It excludes the profile generator and has locked in ColorMatch to Epson media profiles. No custom profiles etc.